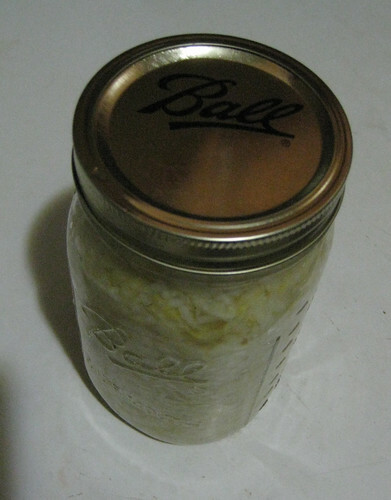 My Partner in Fermentation and I have embarked on yet another sauerkraut adventure. After trying it with too much salt, too little salt, not enough packing down of the shredded cabbage, and letting it ferment in a place that we now know was too warm, we may have gotten all the variables to line up in our favor. It’s been three days, during which time Rosh Hashana came and went, and I just opened one of the two quart jars. It had been sitting in my bedroom, the one place in the apartment that’s consistently 70 to 72 degrees — the preferred temp for those lactobacilli that make it all happen. The cabbage looked well covered in liquid, thanks to the innovation of pounding it with the salt before packing it into jars. The opening of the metal cap was accompanied by a slight slurp and a few bubbles. Then more bubbles. Then more, percolating up to the surface so fast I speed walked it to the kitchen sink, visions of shaken up seltzer bottles sputtering before me. There was no overflow, thank goodness, and another boon–it tasted pretty good! Just the right amount of natural vinegar flavor, with no bitterness or should-I-be-eating-this?-prompting weirdness. It’s got a bit of a spicy tang, too. I only hope that I can take this same tenacity–and success–through the coming days of t’shuvah (repentance) and into the year ahead. Have 2 quart-sized (32-oz./1 litre) Mason jars and tops ready. In a large mixing bowl or cooking pot, toss the cabbage with the salt and the whey. When it’s good and mixed, let stand for 15-20 minutes. It should start to get juicy. Now, using a mallet or an unopened wine bottle or some equally heavy, blunt instrument, pound the crap out of it. Keep doing this until there’s enough liquid to cover the cabbage. The cabbage will reduce in volume while the juices increase, so this should work out eventually. Now pack the cabbage into your two jars. If there isn’t enough liquid to cover the cabbage, add more whey or salted water. Screw on the tops firmly. Let sit in 68 to 72-degree temperatures for 3 days. Check for flavor after the 3 days and allow to ferment longer if desired. You can try refrigerating one jar at one level of fermentation and let the other sit out for another few days, tasting every now and then until it’s reached the perfect state of sourness and yumminess. This entry was posted in Holidays, Philosophizing, Recipes. Bookmark the permalink.